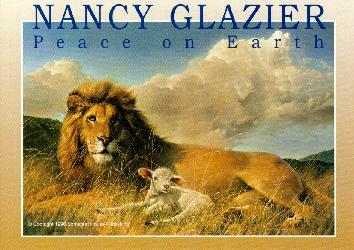 Nancy Glazier's Limited Edition print "Peace on Earth"
Peace on Earth represents a milestone in Glazier's growth as an artist. that peace on earth is possible? "I got to know this lion while painting him. He was amazing! He would let me come right up to him and snuggle his mane. Peace on Earth __21" x 30" * 1200 Signed and Numbered.